Hidebound means stubbornly conservative, narrow minded, traditional. Medieval bibles were often hidebound in more than one way. Reading the Scriptures was restricted to the clergy and their interpretations came down from the church hierarchy. Five hundred years ago, the Protestant reformation argued over the issue of salvation by faith alone. However, the Protestants did not challenge many of the Catholic philosophical traditions. Three medieval traditions affect how modern Christians interpret creation and earth history. 1. 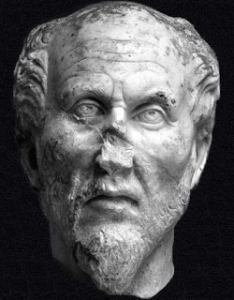 Plotinus was a pagan philosopher who influenced Christianity through Augustine. Plotinus imagined a pure dunamis (the One) without which nothing could exist. The One never undergoes any change and knows neither past nor future, all things co-existing in the eternal now. Augustine interpreted the Bible with Plotinus’s ideas about the eternal present. He speculated that God was eternal, that is outside of time, seeing all the future at once. Augustine also imagined that God created time in the beginning but time does not affect Him since eternal has to do with a timeless existence. The Bible uses active verbs to show how God brings about His plans for the future, without injustice. It never says God sees the future. Modern translations follow the Augustinian tradition and therefore render Genesis 1:1 as, “In the beginning.” The notion that time actually exists or that it could be measured did not exist in Moses’ era. 2. Friar Thomas was the most influential philosopher of the western system. He argued that God is absolute Being, ipsum esse per se subsistens (the self existing one who is static and unchanging). The creation came into existence by the creative will of God and so gets its essence from Him. Eventually westerners came to believe that substance has an unchanging essence. Although everything can change, what a thing is, its being, its essential nature, its essence, derives its existence for the changeless God. The essence of substance is changelessness became the foundational assumption of the western science. 3. The idea that matter is not continually changing itself, changing relationally, eventually produced the western concept of linear time. Four hundred years ago Galileo noticed that bronze balls rolling down an incline sped up with the square of the “elapsed time.” The idea that clocks measure linear time became the foundation for mathematical empiricism. Tens of thousands of measuring units and mathematical constants were contrived using the notions of unchanging matter and linear time. Peter used the phrase arche kitiseous that can mean a first law in 2 Peter 3:3 – 6. Peter predicted that last-day mockers would obfuscate the age of the plural heavens and Earth’s watery past with their first law, their that all things remain the same. Indeed, the idea that the properties of matter are not relationally changing is the foundational assumption for the scientific definitions of time, energy, mass and gravity. The empirical measuring units and the laws of physics were founded on the assumption that matter is not continually changing itself. As western science advanced, the notions of a benevolent Creator God who created ex nihilo (out of nothing) 6,000 years ago came under attack. One of the most challenging problems came from billions of ancient galaxies and ancient geological formations. Christians tend to be conservatives so they vigorously defended the medieval interpretations of creation ex nihilo. What if we examine the text without tailoring it to fit western philosophy? Moses wrote the creation as a series of processes, in which the Hebrew grammar emphasizes continuing actions. Even when Elohim rested on the seventh day, there is continuity. “Thus the heavens and the earth were completed, and all their hosts.” The Hebrew verb translated “completed” is pual imperfect. It means that God passively finished making the plural heavens and Earth stronger, more in number and more real by the sixth day. The verb for “completed” is also imperfect showing that the finishing of the heavens and earth continues. Thousands of years later, Isaiah 40:26 claims that God continues to call the stars to come out, as He spreads out the heavens in unbroken continuity, yet no star goes missing. One the first day, Elohim created (completed action) the plural heavens and the Earth. What He created was formless. Then Elohim’s wind intensively and intensively dithered in unbroken continuity over the formless face of the dark, transitory thing and Elohim continued to command light to continue to be. Indeed, experiments show that matter is a relation with light that never stops dithering around within, giving substances their extension and various properties. On the next day, He continued to command the waters to be separated by an expanding atmosphere with some water above the atmosphere and some below. This was not ex nihilo creation since he continued to call on natural things to act to form the spreading atmosphere and the ice rings above the air (see the Hebrew text for Proverbs 8:28). On the next morning and evening He continues to command the waters to be gathered into one place. As the waters seeped underground into the tehom (the subterranean deep), the dry land appeared. Then He continued to command the ground to produce plants that grew into trees and had fruit. On the fifth and sixth days, He continued to command water to teem with life and for the ground to continue to produce animals that reproduced themselves. The fourth day is the most important for us today, because we confirm the creation with telescopes, as described on this day. He continued to command lights in the plural heavens to serve as markers for days, seasons and years. He continued to form the Sun, Moon and stars and continued to make them into things that spread (raqiya). Raqiya is the noun form of the Hebrew verb to spread out. A few thousand years ago our ancestors claimed that planets passed close to Earth, causing catastrophes. Over the centuries they measured a decreasing solar parallax with angles. Angles are a unique form of precision measuring, since they do not depend on the theory that matter is not changing itself. There is no way to contrive linear time with spreading orbits. Visible cosmic history is the most powerful evidence for a literal rather than a traditional (ex nihilo) interpretation of the creation account. We see how the earliest galaxies were often naked, without starry appendages. We observe, at many ranges, how the stars continued to form and emerge from the formless heart of galaxies. The stars continued to spread out, exactly as in the literal Hebrew text, but not in the traditional exegesis. We also observe how ancient atomic clocks dithered at tiny fractions of the frequencies of modern atoms. We observe how the space matter takes up continues to change as its inertial properties also change as billions of galaxies grew into huge, local, starry, growth spirals. Even the continents on Earth only fit together on a tiny globe without major surface seas. The Bible states three times that the Earth spreads out in unbroken continuity. The image of the growing Earth, as new oceans form – spreading apart the continents, is from Michael Netzer. In billions of ancient galaxies we observe that none of them shine with the light frequencies of modern atoms. We observe the continuing spreading out of the stars, as spelled out in the Hebrew creation text. We observe that the hidebound metaphysics of the western system is false. Lift up your eyes and look and give glory to the Creator who will make foolish all philosophical reasoning. Man cannot come to know Him by means of humanist reasoning. Yet He accepts every sinner who turns from all his religious works and trusts Christ alone. The statue may be of Plotinus, the pagan philosopher who had a profound effect on Christians theology. The picture came from wikipedia and is licensed under the Creative Commons Attribution-Share Alike 3.0 Unported license.